Minister Ceci announces new flood resilience grant funding for Calgary and other Alberta communities. 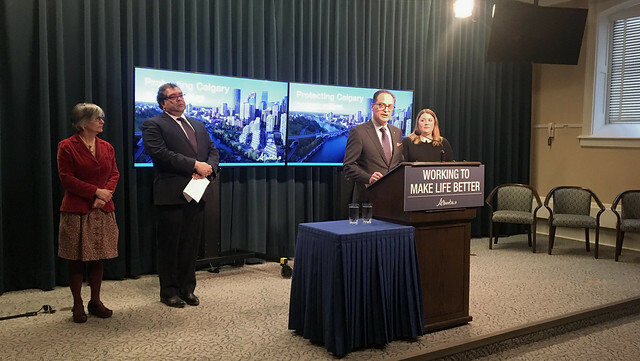 As part of its $150 million in dedicated funding to Calgary, the province has approved new Alberta Community Resilience Program grants totalling $15 million for two high-priority projects in the city. This year, the government will invest more than $43 million for 15 flood mitigation projects across the province. In Calgary, a permanent flood barrier will be built to protect the downtown area and a stormwater separation project will protect the community of Sunnyside-Hillhurst. The downtown flood barrier will extend from the newly completed West Eau Claire flood barrier to Reconciliation Bridge to protect the downtown area against high flows on the Bow River. The separation of the Upper Plateau stormwater system from the community of Sunnyside-Hillhurst will mitigate the risk of flooding and backflow into the community during high water events. Both projects are in the preliminary design stage. In total, $43.2 million approved through the Alberta Community Resilience Program will support 15 flood resilience projects across the province this year, including the Horsefly Spillway Project in the Municipal District of Taber. This 14-kilometre spillway will extend from the St. Mary River Irrigation District main canal to the Oldman River, increasing flood attenuation capacity in the region. Construction of flood mitigation works in Edmonton at the City’s Rossdale and E.L. Smith water treatment plants to address riverine flooding risks and help safeguard the city and region’s drinking water. A flood berm to protect the lower townsite of Fort McMurray to the one-in-100-year ice jam flood elevation, plus freeboard. The relocation of water wells at Siksika Nations’s Arthur A. Youngman water treatment plant out of the flood hazard area to secure the nation’s drinking water from the impacts of high water events. Construction of drainage improvements on NE2 road in Saddle Lake Cree Nation, which is the only access roadway to more than 160 homes as well as the community healing lodge and water treatment plant. Construction of a new, naturalized stormwater facility in Westlock and associated drainage channel improvements designed to accommodate the one-in-100-year storm event. Since the inception of the Alberta Community Resilience Program, the province has provided more than $220 million to municipalities and First Nations for flood resilience projects that will help ensure public safety, protect critical municipal infrastructure and better manage stormwater. More than 49 municipalities and four First Nations have received funding through the program since 2015.